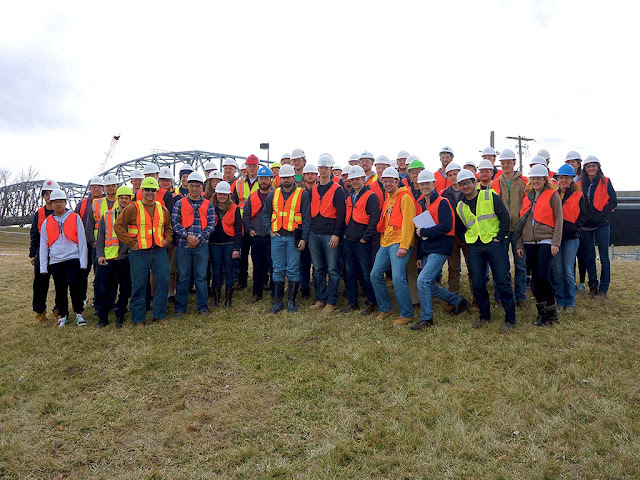 More than 50 engineering students from the University of Missouri recently visited the U.S. 69 Missouri River Bridge project to make the connection between what they’ve learned in the classroom to how that knowledge is applied in the real world. For this project, Garver designed the roadway, the bridge superstructure including the 420-foot navigation span, river piers, and integrated subconsultants into the design team to meet the design demands on a fast-paced timeline. Because the project bridges two states, there was an unusually high number of permits and approvals to obtain—two states, two levee districts, and the Army Corps of Engineers. Students spoke to Garver engineers who worked on the design about some of the issues this project faced. 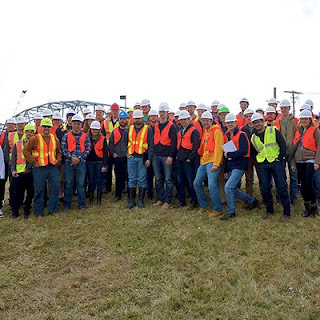 “It’s great for students to understand how engineering works from the classroom perspective, but coming out to the job site to see the various aspects of how the bridge is constructed is an invaluable experience,” said Kansas City Bridge Team Leader Blake Blakemore.